Colton Herta has described his maiden NTT IndyCar Series race win at the Circuit of the Americas on Sunday as “spectacular”. The teenager, who became the youngest driver to win an IndyCar race in history, had a tough start to the race weekend after suffering an engine failure in practice, but he and the Harding Steinbrenner Racing team bounced back to claim an astonishing victory on Sunday. 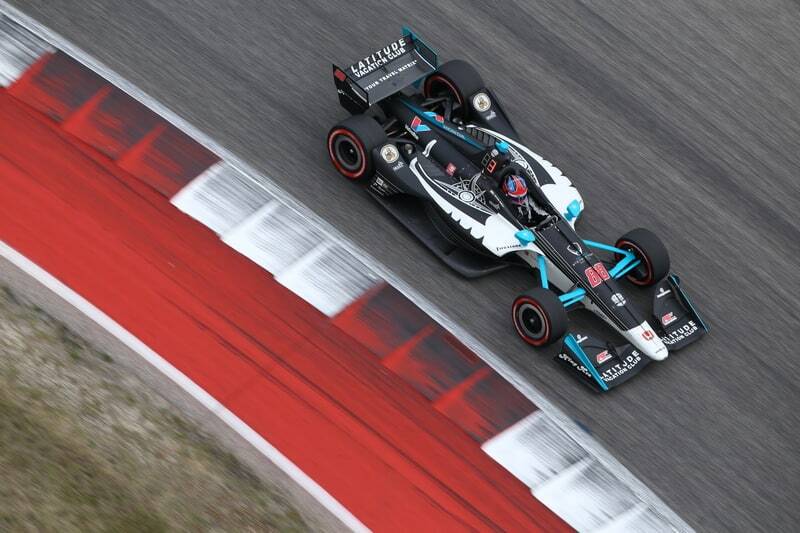 Entering the weekend of the 2019 IndyCar Classic at COTA, Colton Herta was already being tipped a potential dark horse for a podium or race victory. This was largely down to his impressive display during the two days of pre-season testing at the circuit in Austin, Texas, but also down to the speed he showcased at the season-opening Grand Prix of St. Petersburg two weeks prior. Back at St. Pete, Herta’s potentially strong weekend took a bad turn when he was given a penalty during qualifying for impeding Carlin‘s Charlie Kimball. The penalty cost him a spot in the final round of qualifying and relegated him from a grid spot in the top six to a starting position of eleventh place. Herta would go on to finish the race in eighth place, but he felt as though he would have done a lot better had he started further toward the front of the grid. Colton’s hopes for a stronger weekend at the Circuit of the Americas took a hit during the opening session of practice last Friday. Herta ended the opening session with the second-fastest time, but he was forced to pull-over after smoke and flames began to erupt from the back of his #88 Honda. The damage to Herta’s car was substantial enough to prevent the American from taking part in all but the final moments of the second practice session later in the day, costing himself and the team a lot of valuable data. “Today was a challenging day, to say the least,” Colton said on Friday, “We were quick in Practice 1, but struggled in Practice 2. We just couldn’t get the balance right on the Firestone red [alternate] tires, but I know the car can be quick and that we have the pace. We’re focused on getting fast with the red tires because we know what to look for now. Thankfully for both Colton and Harding, Friday’s engine issues would not come back to haunt them for the rest of the weekend. On Saturday, Colton would start the day by setting the twelfth fastest time, but he was confident that the car was fast enough to be a contender in qualifying. Colton would go on to prove himself right in the qualifying session later that day. He would easily advance out of the first round, not being caught out by the red flag in his session that had been caused by Jack Harvey. In the second round, Colton was one of only three drivers to lap in the 1:45’s, thus setting what would be the third fastest lap-time seen over the course of the entire weekend. In the final session, the top-six shootout for pole position, Colton fell down one position to set the fourth fastest time, with his lap-time of 1:46.3594 just three-tenths of a second off of the pole position time set by Team Penske‘s Will Power. It was an impressive performance from Colton and Harding, with the result being Harding’s best-ever grid spot for an IndyCar race and only their second appearance in the final round; the first of which coming courtesy of Patricio O’Ward at Sonoma Raceway last year. In the opening melee of the race on Sunday, Colton maintained his position of fourth place and, soon after, found a way by Ryan Hunter-Reay to break into the top three. For a majority of the race, Herta, along with race-leader Will Power and second-placed Alexander Rossi, would open up a gap to the pack behind, forming a three-car breakaway. Whilst Power maintained his lead for most of the race, Herta and Rossi would trade second place numerous times, with both drivers ebbing and flowing depending on the tyre compound that they were on. As the race progressed past the halfway mark, however, Power and Rossi began to pull away from Herta, with Colton looking likely to hold on to a third-place finish. Colton came in for his final pit-stop of the race with just under twenty laps remaining. Soon after, the race was turned on its head. Felix Rosenqvist and James Hinchcliffe would make contact whilst fighting for position heading into the final corner. Rosenqvist’s #10 Chip Ganassi Racing Honda would be sent into the wall just before the entry to the pit-lane, thus bringing out the caution right in the middle of the final pit-stop sequence. Pretty much the entire field had already made their final stops, but the top three drivers at the time, Will Power, Alexander Rossi and Scott Dixon, had not. As per IndyCar Series rules, the pit-lane was closed when the caution came out, with the top three being restricted to pitting once the field had been bunched up behind the safety car. As a result, all three would be forced to restart the race deep in the pack, with former dominant race-leader Power being dealt an even worse blow when he was forced to retire after a driveshaft failure. The caution and subsequent pit-stops would put Colton Herta at the front of the pack for the restart, which left just over ten laps remaining in the race. Despite no longer having to worry about Power, Rossi or Dixon, Herta now had a fresh challenge in the form of the defending race winner, Josef Newgarden. However, on the restart, Herta was in a league of his own. Colton was able to build up a lead of over a second on the first lap and then went on to gap Newgarden by over four seconds heading into the final lap. Herta would back off a little for the final few miles of the race, allowing Newgarden to close in by around a second, but it was not enough for Josef to try and take the victory away. Herta would cross the line at the end of lap sixty to secure a stunning first victory in the NTT IndyCar Series. At just eighteen years and eleven months old, he would also become the youngest driver in history to have won an IndyCar race, taking the record away from Graham Rahal, who was the previous youngest winner after winning the 2008 Grand Prix of St. Petersburg at the age of nineteen. The win would also be the first for Harding Steinbrenner Racing, a remarkable feat for a team that had only entered twenty-one IndyCar races before COTA. “Just to be up with the names of people that have won a race, I’m going to live and die an NTT IndyCar Series winner, which is spectacular in itself,” Colton said yesterday. Colton was then asked about whether he thought he had a chance at the victory after qualifying in fourth place on Saturday, to which he replied: “I didn’t think it was going to happen. Seems like Will [Power] and [Alexander] Rossi had a bit of a pace advantage on us. I thought the max we were going to get was third [place] without a caution. The caution came out. We did our best. As a result of his win yesterday and his eighth place back at St. Petersburg, Colton sits in second place in the standings heading into the next round of the championship in Alabama in two weeks time. The American, who will turn nineteen before the race, will be hoping to keep the momentum going on what is already a fantastic rookie campaign in the NTT IndyCar Series. The third round of the 2019 NTT IndyCar Series, the Grand Prix of Alabama at Barber Motorsports Park, will take place on Sunday, April 7.